See this changelog for a quick list of all changes in version 4.13. Here we dive into some details about specific topics. 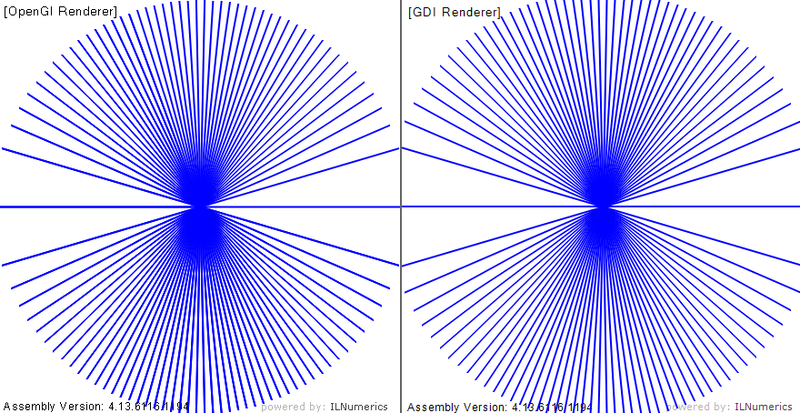 The main goal of the GDI renderer is still to provide a fully compatible alternative to the OpenGL renderer. It automatically replaces the OpenGL default renderer if a problem / incompatible hardware etc. was detected at runtime. The focus lays on feature completeness and precision of the rendering result. 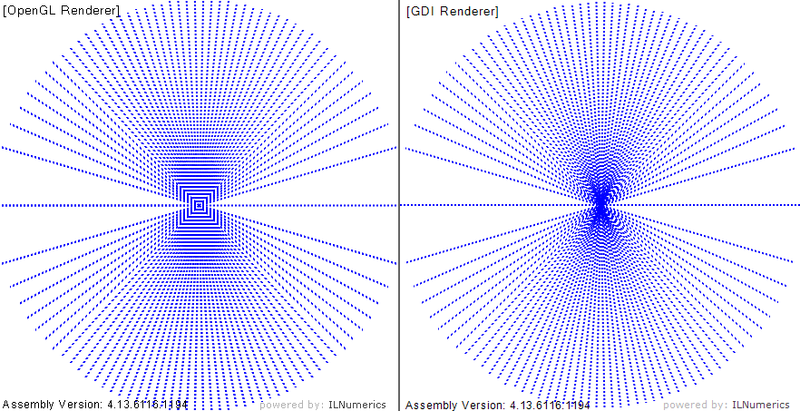 The quality of the GDI renderer has been further improved to these regards in 4.13. Changes affect the following low level rendering features. Lines now recognize the ILLines.Antialiasing property for thick lines (Width > 2). The antialised rendering works in all situations: transparent lines, lines with stipple patterns, inside /outside of plot cubes and for logartithmic / linear axis scales. The quality of the antialiasing implementation is now on par with common OpenGL implementations. The new default value for ILLines.Antialiasing is now true. However, thin lines would not profit from antialiasing, hence thin lines will continue to ignore the value of the ILLines.Antialiasing property. Note, that some OpenGL drivers actually refuse to render certain combinations of line properties. We experienced such behavior for stippled, thick line strips having antialiased rendering configured. In such situations you should make sure to have the most recent OpenGL / graphics card drivers installed. Alternatively you may chose either stippled pattern – / or antialiased rendering by explicitly configuring your lines for either one setting. Or use the GDI renderer instead. Basic, low level line shapes are now created with a default color: black. Higher level objects (as ILLinePlot, ILSplinePlot, Markers, ILSurface etc.) should always provide a color for low-level objects or use vertex based coloring explicitly. If you are assembling your scene with the low level line objects make sure to check that you have done this. This is not a breaking change. Note that the setting for the shapes Color property overrides the vertex colors buffer (Colors property). In order to use vertex based coloring one must set the Color property to null, enabling the colors information from the Colors buffer. ILSplinePlot (derived from ILLinePlot) now adopts the auto-coloring feature from the ILLinePlot class. When no line color was given at the time the plot was created the color gets assigned which comes next in the ILLinePlot.NextColor color enumeration. Use the linecolor constructor argument of ILSplinePlot or the Line.Color property in order to control the color of the spline line explicitly. As you noticed there was a great deal of changes coming with VS2017. This includes the installer system which is – great attempt! – much more slim now by omitting unneeded stuff from the installation. But VS2017 also requires changes to the manifest files facilitating every Visual Studio Extensibility project. A new version has been introduced: version3. This is the first version which is not compatible with Visual Studio 2010 anymore. As a consequence, by supporting the new extension packaging system we would be required to drop support for Visual Studio 2010. This is not too dramatic since the 6 years VS2010 is out now feel kind of an eternity in our dev-world. However, we wanted to give the remaining VS2010 customers at least one version iteration of deprecating VS2010 in order to jump to a more recent version smoothly. Additionally, the way the new VS installer works seems to reflect not the last word spoken on that topic (at least this is what we hope). The bottom line: we use an MSI installer, wrapped in an exe bootstrapper. The MSI installs all GAC binaries, registers the development dlls in Visual Studio, maintains the singleton installation directory and triggers the VSIX installer which installs the extension into all supported Visual Studio installations located on the system. This may sound complicated but worked quite reliably over the years. Currently, some smart (WIX) people are attempting a solution to this. But we are not aware of a clean solution released already. Therefore, we will wait for it and/or eventually consider a new deployment scheme for our extensions. However, luckily there is a simple workaround for now! After the ILNumerics installation was finished, you can easily install our extension into VS2017 manually. Just go to the installation folder (by default: C:\Program Files (x86)\ILNumerics\ILNumerics Ultimate VS\bin) and find the ‘ILNumerics.VSExtension.vsix’ file. Double click on it to start the installation into the remaining Visual Studio instances manually. This should work without problems. Be sure to accept the warning dialog during the install. 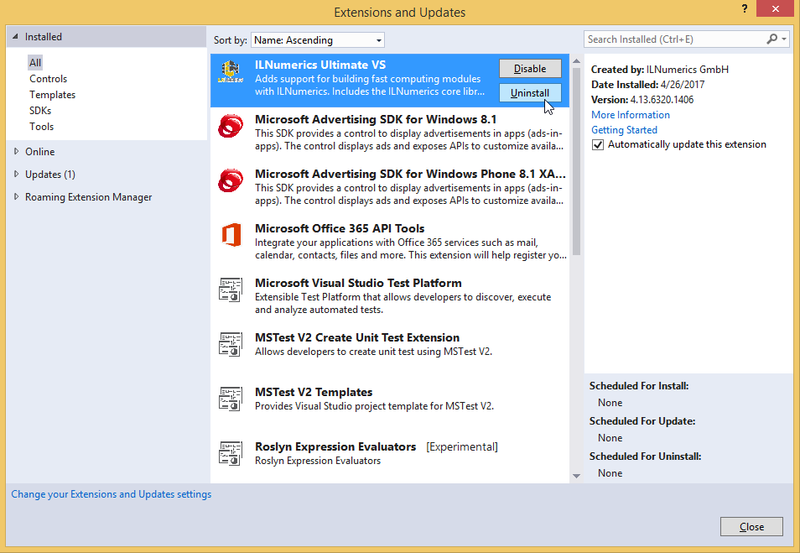 It originates from the fact that our extension must still support older Visual Studio extension techniques. A manually installed extension requires a manual uninstall. Also, in difference to the machine wide installation done by the (administrative) MSI install the manual VSIX installation changes the local user account only. You may have to repeat the VSIX install for other user accounts. Besides these lowered installation experience we know of no other incompatibilities in Visual Studio 2017. Did you ever miss a certain feature in your ILNumerics scene graph? You probably did. But did you know, that most of the missing “features” mean nothing more than a missing “property”? Often enough, there is only a convenient access to a certain scene graph object needed in order to finalize a required configuration.